The next time you think about picking up the ‘diet’ version of your favourite pop drink then perhaps, after reading this, you’ll think again. We all believe that we’re doing ourselves a favour by choosing the ‘sugar free’ alternatives when it comes to food but perhaps we should be stopping to think about what it is that keeps the sweetness in our favourite foods if the sugar isn’t there. Aspartame is the most widely used sweetener in the world. It’s 600 times sweeter than refined white sugar and therefore the tiniest amounts can really sweeten a food or drink. It’s the non-calorific and therefore finds its way into a lot of the ‘low fat’ and ‘diet’ versions of foods in the supermarket. It was first put into foods in the USA in 1981 and was quickly added to soda based drinks after this. By 1983 it was in world-wide consumption. Since then, over the past twenty years, there’s been a lot of research in the medical sector over the effects of the consumption of Aspartame and the effect it has on the body. Aspartame is made up of three parts: methanol, phenylalanine and aspartic acid. Methanol is one of the simplest forms of alcohol whilst both phenylalanine and aspartic acid are amino acids which both naturally occur in protein rich foods but aren’t meant to be consumed in an isolated state such as this composition Aspartame is made from. When broken down by the body after digestion, Aspartame affects the neurons in the brain by over-exciting them which, in short, kills them off. Consumed in large quantities Aspartame has been known to contribute to severe memory loss over time and can also accelerate the effects of Alzheimer’s. It’s also known to be connected to the growth of brain tumours as it encourages free radicals to attack the over-excited cells in the brain. Symptoms of sustained aspartame ingestion include headaches, dizziness and nausea, insomnia, irritability and heart palpitations – especially when consumed with carbohydrates containing refined sugars. It’s believed that over 80% of the world’s population has aspartame sensitivity but many attribute the symptoms listed above over to other health issues or foods they’ve consumed. It’s also estimated that over 75% of additive sensitivity and allergies are purely due to aspartame. And perhaps the most horrifying thought? Aspartame has been linked to birth defects in newborns when the mothers have consistently and regularly consumed vast quantities of it. Whilst there is no definitive conclusion that should you drink a fizzy pop can or eat a ‘no sugar’ yoghurt whilst pregnant your unborn baby will suffer for it, as birth defects can be caused by a number of factors, it does give cause for concern. Whilst all of this may read more like scare mongering than anything else, the facts have come from years of research and medical investigations. Maybe it’s time to think twice before picking up the diet cola when in a rush. 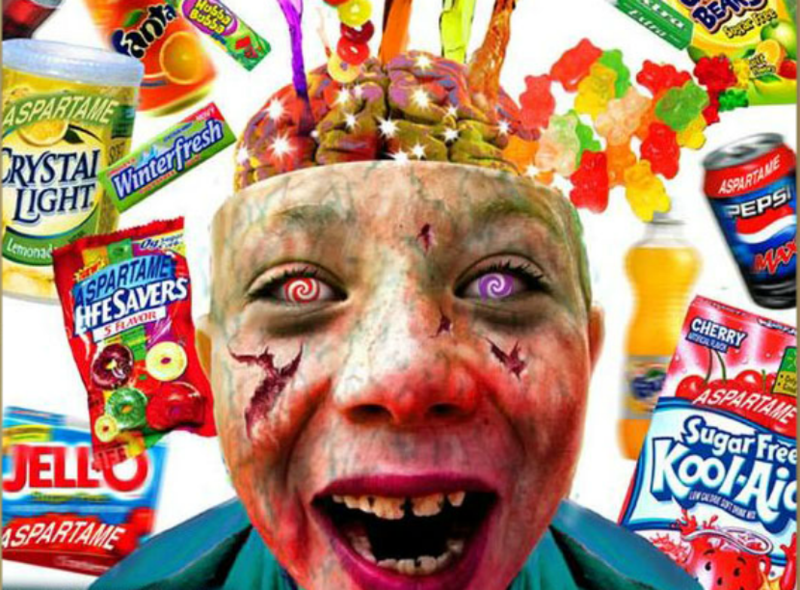 This being said, many studies have found Aspartame to be safe for human consumption. What they fail to add to that statement is that it’s only safe if eaten in very very small quantities, and of the studies that have been funded that have bought about this result a lot of them have been paid for by companies that produce Aspartame or use large amounts in their products. So, if so many foods contain Aspartame how are we supposed to know what to avoid and what to eat? Aspartame can also go by the alias Additive 951 or Additive 962 (dependant on the brand that includes it) so check the labels of the foods you eat. It’s best to avoid ‘diet’ and ‘fat free’/’sugar free’ foods as much as possible too as these are where the sweetener is most commonly in abundance. The best idea is to accept that whilst we can’t completely escape it, unless we become completely organic eaters (bare in mind that organic food only has to contain 95% organic ingredients to be certified as such and therefore some additives can be added in very small amounts without jeopardizing the ‘organic’ label), we can be very choosy about the products that contain vast quantities and the products that only contain trace amounts. As always though, if you’re not ready to quit the Diet Coke (or Coke Zero) or stop enjoying your Muller Light yoghurt the remember that everything should be eaten in moderation and that fresh vegetables should take precedent in most snacks and meals. I normally tend to avoid low fat options of most things because I find that when the sugar is taken out and aspartame added in there's no taste, Diet Coke and Coke Zero are the worst, they're both disgusting. I've also been warned by my boyfriend about how nasty aspartame can be over time if you have loads of it. He also has some kind of problem with consuming it. I'm not sure what causes it or what technical name it may have or whatever but if he has anything with it in it forms crystals in his wee, which as you can imagine is really painful when he goes to the loo!